Join WAH! Korea Club today! What is WAH! Korea Club? In recent years, the ‘Korean craze’ has been very evident in Singapore. From dramas, music, food, cosmetics to the language itself, Singaporeans are embracing all aspects of Korea. WAH! Korea is a supporters club for Korea under the Korea Tourism Organization (Singapore Office) and the main aim is to create a platform for ‘Korean Lovers’ to spread their love and passion for the country! Why is it called WAH! Korea? The name is an integration of something unique to both Singapore as well as Korea. We combined the "Singlish" of "WAH" Sound together with the pronounciation of "Come" (와) in the context of Korean, which also sounds similar to "WAH". With this, both Singaporeans and Koreans can relate to such a significant and unique name! WAH! Korea members are a pool of volunteer ambassadors for Korea Tourism Organization. Club members can contribute to WAH! Korea by supporting Korea Plaza activities and events and also promote Korea through Social Networking Sites (Facebook, Twitter, blogs and etc) or organize activities that aim to promote Korea as a tourist destination. Benefits for WAH! Korea Club Members WAH! Korea Club members are given special privileges to participate in exclusive members-only events, Korea Plaza activities (eg. Korean Language Classes, KPOP Dance, Korean Food Making Classes and etc), and enjoy exclusive discounts at our official supporter stores such as Korean restaurants and language schools! WAH! Korea Club members will also be rewarded for their active participation and promotion of Korea through the Points Accumulation System (PAS)! Click here to find out more about the benefits you get to enjoy as a WAH! Korea Club member. How much must I pay to be a member and how can i sign up as a WAH! 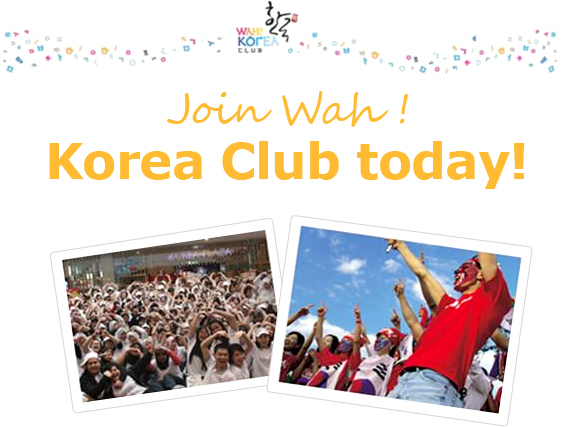 Korea Club Member? The WAH! Korea membership is absolutely FREE and membership lasts for a lifetime! Fill in your personal particulars in the Application Form and click “submit”. You will then receive your Membership Number (S10XXXX). Please quote this number to sign up for our classes at Korea Plaza! To collect your membership card, simply take note of this number and bring along your NRIC or Passport and head down to our office at Korea Plaza to pick it up anytime after you have signed-up! Registration is ongoing so join us today! Join us as a WAH! Korea Club Member today!